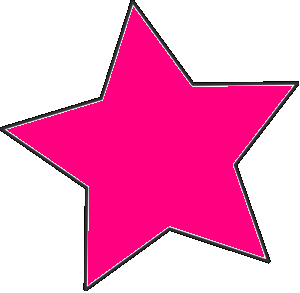 Long time no blog posts! I sound like a broken record, but I was sicker than usual in November and early December and then I had to scramble to get a bunch done. I’ve sewn 50 yards in December! I’ll probably be sharing the things I made with those 50 yards in January along with my TOP 5 2017. For CSC Party Time, I decided to have a fancy PJ party and made two Burda Magazine patterns: Burda Lace Neglige 01/2017 #125A and Burda Belted Kimono Robe 01/2012 #134AB. I shared this on the CSC the other day, but I thought I would share it here with a few more details. For plus-sized intimates, there are not a lot of options, but magazines like Burda sometimes have themed months and January at Burda usually means either activewear or intimates. 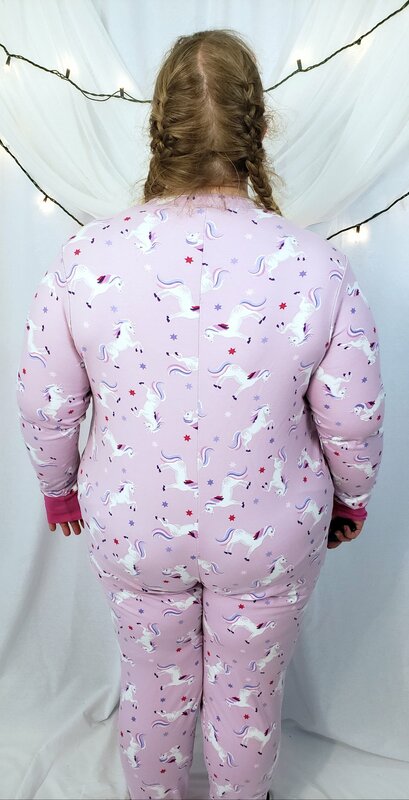 While their plus-sized patterns can often be pretty shapeless and uninteresting, there are occasionally some great collections and actually in the past year there have been more wins than duds for me. The January 2017 intimates collection is one of my favourites and I am slowly going to make my way through it. 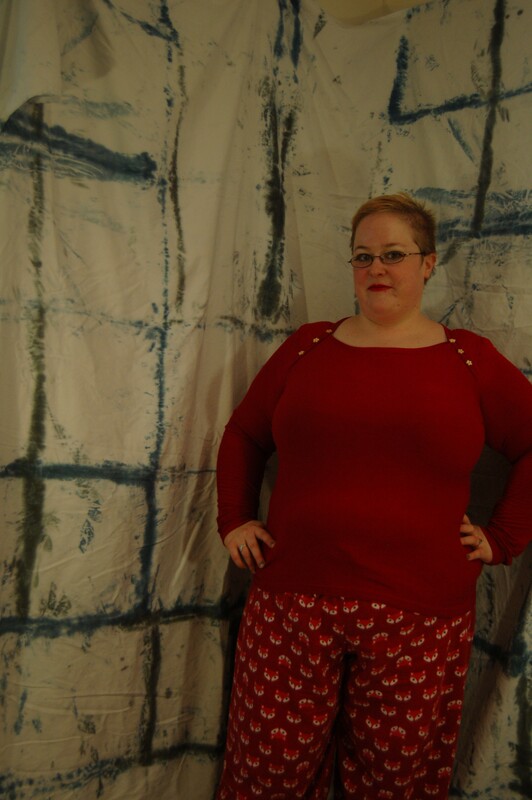 Burda plus sizes are 44 to 52. The sizing is a bit more generous than other companies and goes up to a 48 inch bust and 50 inch hip. That being said, I’m still a bit outside their range with a 50.5″ bust and 54/56″ hips. I am a fan of Burda patterns and find them well-drafted and often lack the major issues that I see in other Big 4 companies (larger than life shoulders and armsyce issues). I will always need to narrow shoulders in any company, but I narrow significantly less with Burda and sometimes don’t need it depending on the design. I have never needed to raise the armsyce or deal with gaping at the bust/armsyce with their patterns. Often, instead of grading up their patterns, I just do a quick 2 inch FBA and get a good fit. I haven’t made a ton of their patterns yet, but that’s my experience so far. 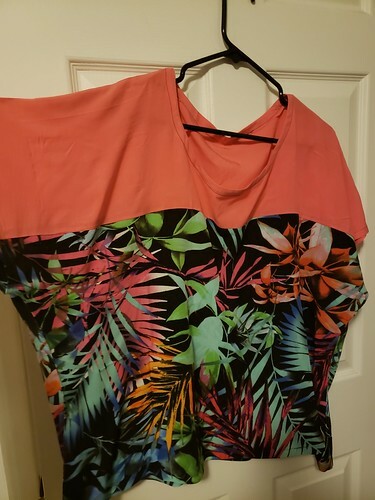 Based on my measurements, I graded size 52 up by 2 inches in both patterns using the slash and spread method effectively making a size 54. I did this instead of an FBA in order to achieve a loose fit all around. 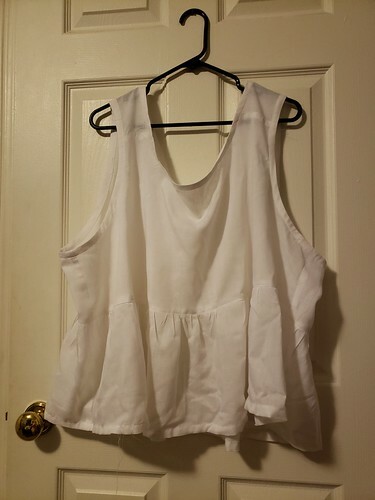 This worked really well, but made the darts on the nightgown a bit off and the neckline is a bit wide (would have likely been fine had I added in the lace). Instead of redrafting the darts on paper, I sewed up the back seam and side seams and pinned the pattern to get the darts in the right place. Curved bust darts (is there a different word for this type?) like this can be a bit difficult, especially with a large bust. The darts aren’t perfect and do angle in a bit at centre front. 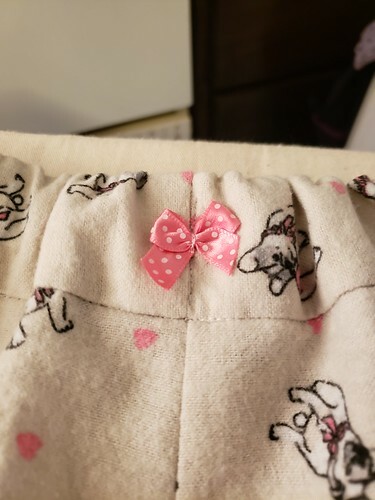 My advice, if you choose to sew this up, is to trim out the centre of the dart before sewing to give you 5/8 inch seam allowance (after pin-fitting them, though, you don’t want to trim and then not have them fit correctly) and then grade the seams to a 1/4 inch again after sewing. It will help you get a better handle on the fabric and make it a bit easier to sew. Curved bust darts like this aren’t used very often in patterns these days (they tend to be seen more in vintage patterns), but can really create a lovely fit and shouldn’t be feared. For the nightgown, I shortened it by about 12 inches in the front and 11 inches in the back for a slight high/low hem. 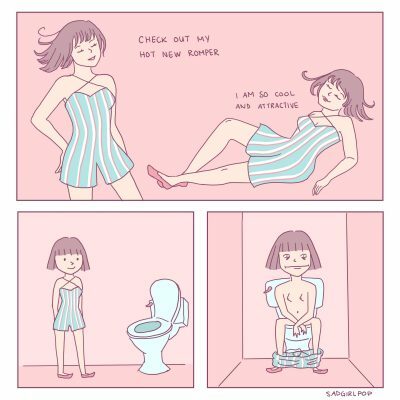 What can I say, I prefer a short, short nightgown. For both patterns, I did french seams for a nice inside finish. I finished the bust dart seam allowances using my serger. The more difficult of the two patterns was definitely the lace nightgown. I’m not super proud of my sewing on that at all, but I really like the finished garment. Not perfect by any means, but lovely to wear. Burda instructions are famously sparse and these are no exception. I would definitely list the patterns as intermediate based on the lack of good instructions. The construction of both is very basic, though, so they aren’t advanced patterns. 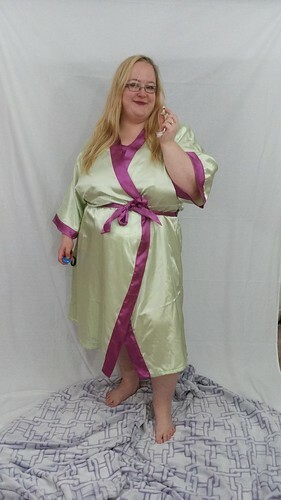 The fit is robe-like for the robe – loose fit and comfortable to wear. I immediately want to make a bunch more. But how many fancy robes does one person need? All of them, Andie, all of them. The original pattern calls for velvet and I can see that being super gorgeous! I can also see making a basic flannel version or a see-through lace version. Mrowwwwrrrrrr. 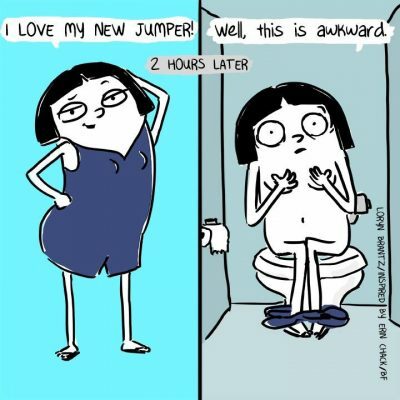 The fit on the nightgown could be better. I actually need a small FBA as there is some pulling forward of the side seams. 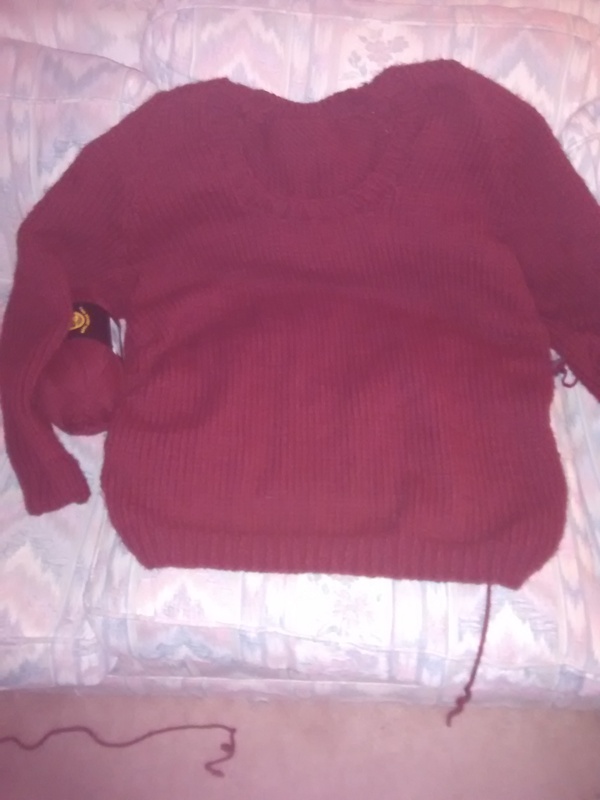 I could also remove an inch from the centre back and bring the shoulders in a bit since the neckline does sit wide. 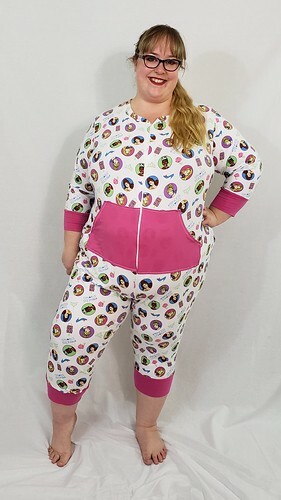 At the end of the day, though, these are PJs and don’t require a lot of overfitting since they will not be seen that often by more people than my husband and the internet in this post. Hahah. I’ve never felt more fancy and luxurious and that is definitely something to celebrate. In terms of time, both patterns were made at the same time and in total took about 8 hours. I’m definitely going to make the robe again. 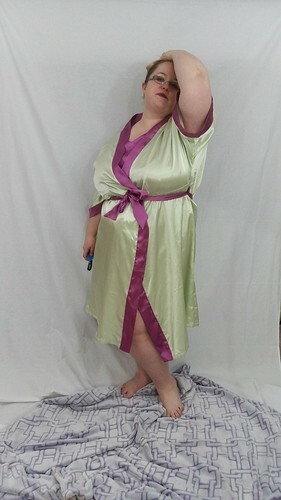 The fabric I used for the nightgown is stretch satin with a crepe back. I didn’t use lace at all. I had mint stretch lace that would have looked nice but didn’t want to be sewn on to the stretch satin at all so I left it off and I still like the nightgown. 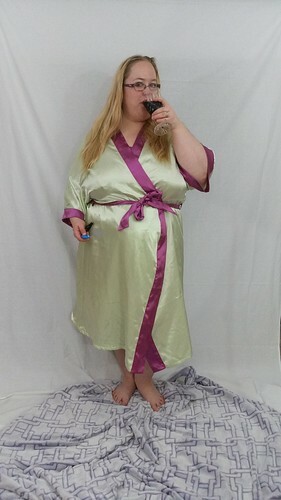 I used the stretch satin as a contrast for the robe along with flannel backed satin to make it extremely cozy as well as luxurious. What’s in the glass, you ask? Root beer. Nothing like drinking soda out of fancy crystal wine glasses! Now that is a party! Pros: Love the curved darts. They give the nightgown extra shape and interest. Cons: The usual sparse instructions issues for Burda patterns. Pros: Everything! I adore this pattern! Make again? : Absolutely! Is it possible to have more robes than actual clothes? Hmmm…. 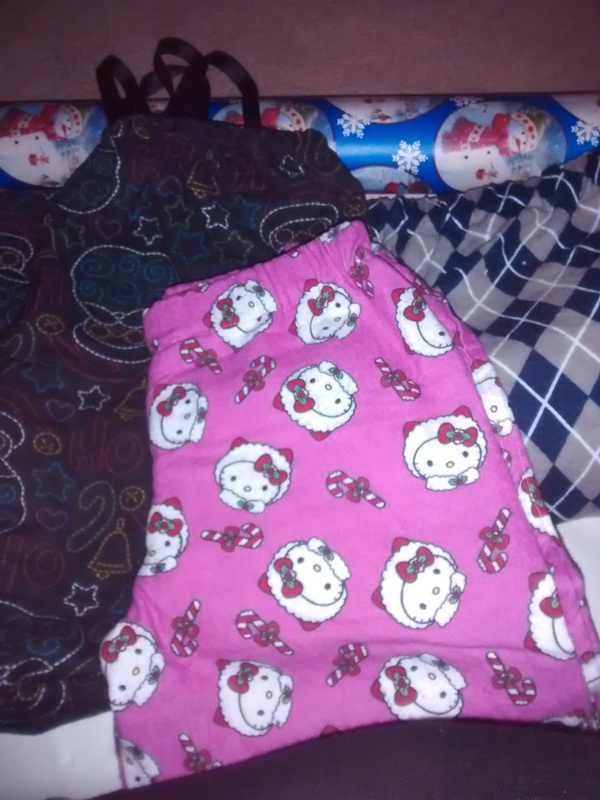 I made pajama pants for myself using the same pattern as my presents to the kids. I thought I would go into a little more detail than in the previous entry, because this time I made them for myself. 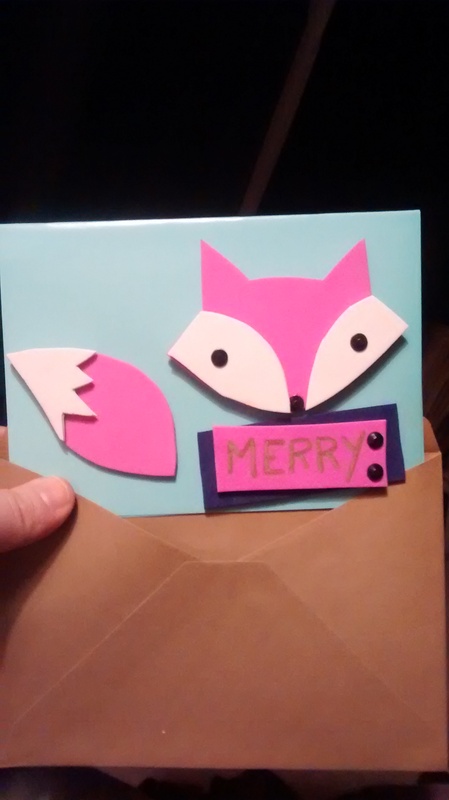 Making gifts you have a different mindset than when it is for yourself. The pattern is a free one from Simplicity so the price is right! It’s a pdf and is absolutely horrible to put together, because it doesn’t quite match up right. Unlike other pdf patterns that have tabs in the middle of the pages to show where to join, this pattern has them on the side and there are three indicators only one of which is the one you go by to match up the pattern. Now that the pattern is together, I will never need to go through that torture again, but it was seriously horrible. 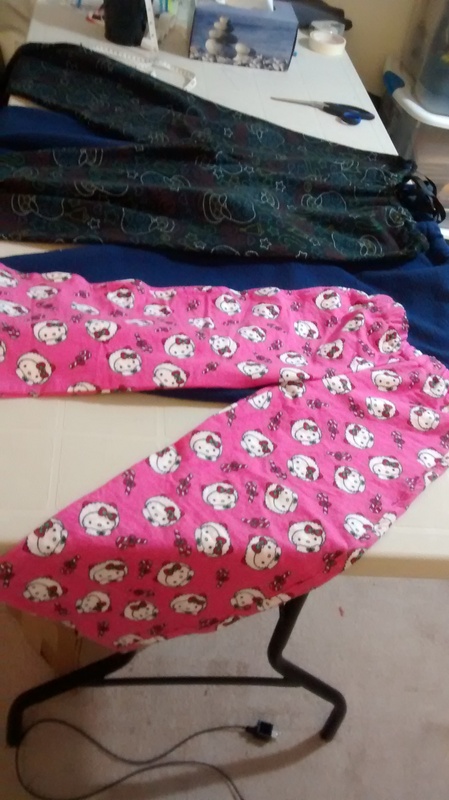 The pattern is pretty straight forward and meant to be a very loose pj pant. Wearing them on myself, however, I noticed things that didn’t pop up or occur to me as I was making them for other people. The pant leg tapers in at the bottom, which makes it difficult to hem the bottoms. The tapering is actually more extreme in the larger sizes and something I will be straightening a little more for any future garments. 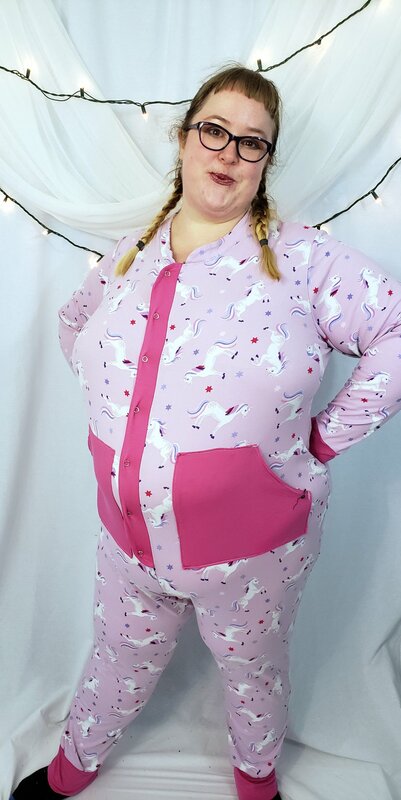 I made smalls for the kids so I didn’t notice; this is graded to an XXL, because I wanted a super loose pj pant, but the XL is still pretty massive. 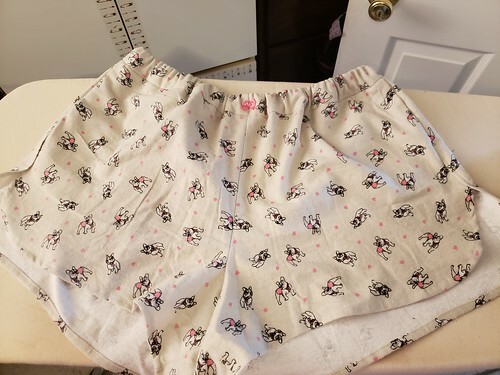 Other than that, it’s a great free pattern and a breeze to sew up: sew up the pant legs, sew up the crotch, sew the waistband, make the drawstring, put in the elastic and the drawstring, hem the pants. Basically an hour or less even with my standard french seams. I think all in all the two pairs took me two hours with fitting checks. When I made them for Christmas presents, they took even less time: more like an hour and a half for two. 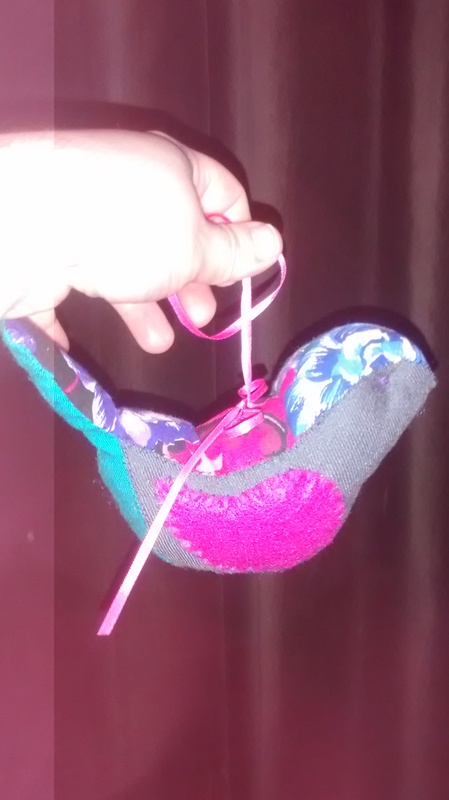 A note for the drawstring: I didn’t sew it inside out and then turn it around. I did that in one of the pj pants for Christmas and wanted to scream. Instead, I pressed it under like I was making double fold bias tape and sewed up close to the fold. At the ends I turned the raw edged into the folds. It’s way way easier that way than the sew and turn method. I even used tricks for that method and it was just not my thing. I probably won’t make this pattern again for a while. I really want to make Sewaholic Tofino pants in the short version as part of my summer sewing plans. 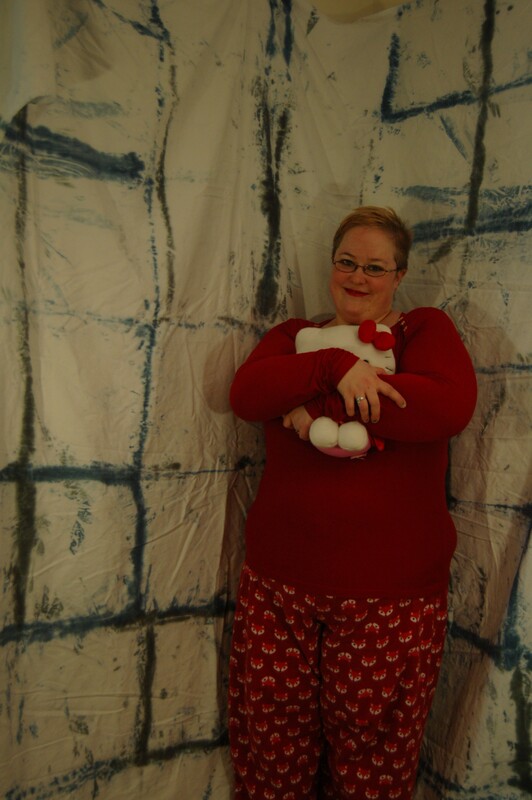 The fabrics are flannels from Joann’s. Pros: Did you read free? 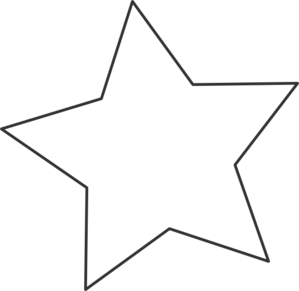 Also, very simple pattern. And it’s free! FREEE! Cons: Tappered pant leg makes it difficult to hem, especially in the bigger sizes. Recommend straightening a little more for future garments. PDF is an absolute pain to put together. And of note, if you are making it for other people, the pattern doesn’t provide a standard measurement for the elastic. I recommend doing a quick standard measurement search for that. Make again? : Absolutely! Considering I never will put that pdf together again. 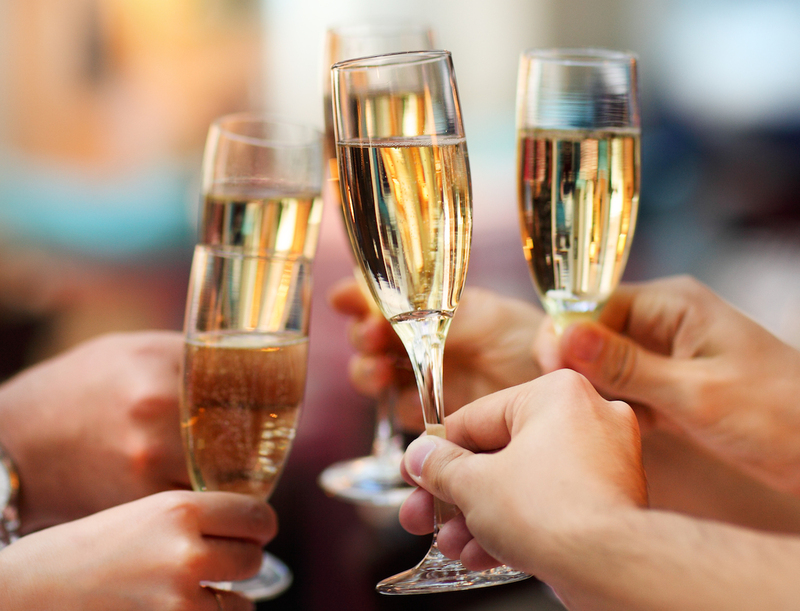 First off, happy new year to everyone! I have some catch up to do, because I was mostly sewing and not thinking about much else and not reading many other blogs, either, so it seems I have quite a lot of catching up to do everywhere. I’ve been off work since the 19th and sewing like crazy. I love sewing vacations! Now that is it well past Christmas, I can talk about the gifts I made this year. 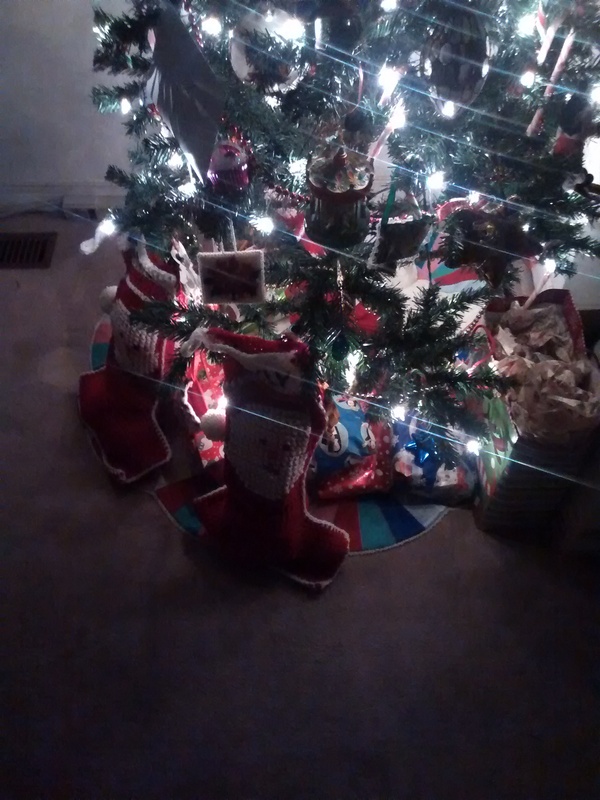 It was my goal to mostly make my gifts. I am hoping next year I will do more of that. I found it to be more economical for me and far more meaningful. 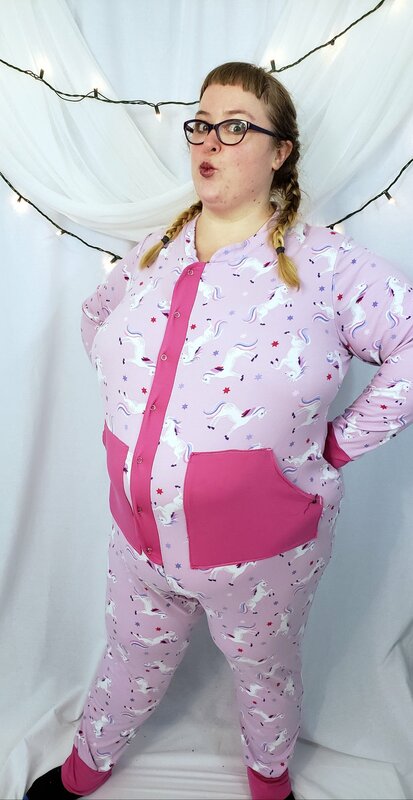 I made a total of four pj pants for this (but I won’t count one of them in the gift list). The grey and blue argyle flannel was delayed in the mail and in a flurry I decided to make them out of blue fleece in my stash. But then I delayed sending the presents and the argyle flannel arrived and I made the final pair of pants and sent the package of presents to them. The package still got to them in time, along with some tasty chocolate. 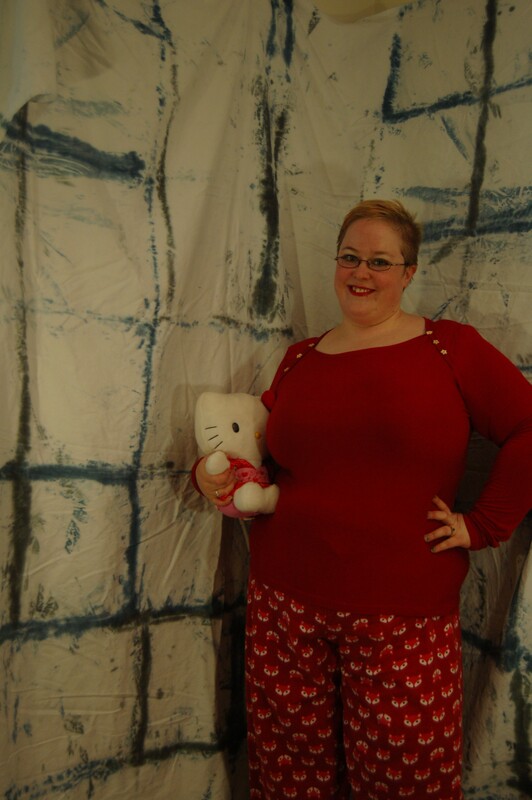 The blue fleece pj pants, though, ended up being big enough for me. Score! After six pairs of pj pants, I am now a pj pant expert. 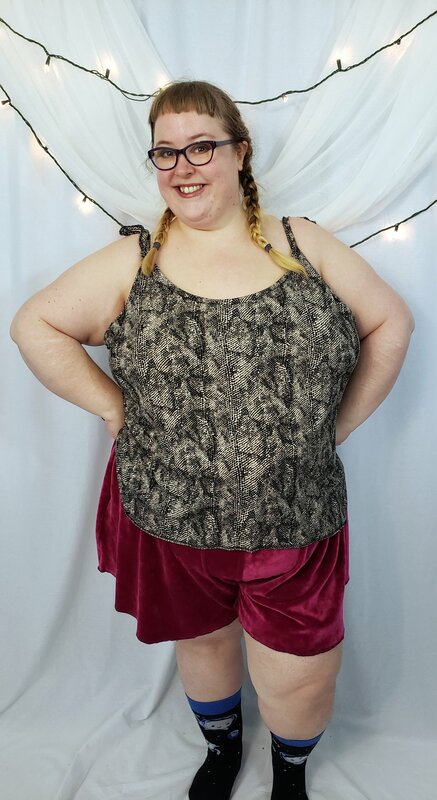 I used the free Simplicity pj pant pattern. It’s an easy pattern to create. All the fabric, minus the Toronto Maple Leafs and the blue fleece came from Joann fabrics during their Black Friday and Cyber Monday sales. Even after the shipping prices, it was a very good deal. 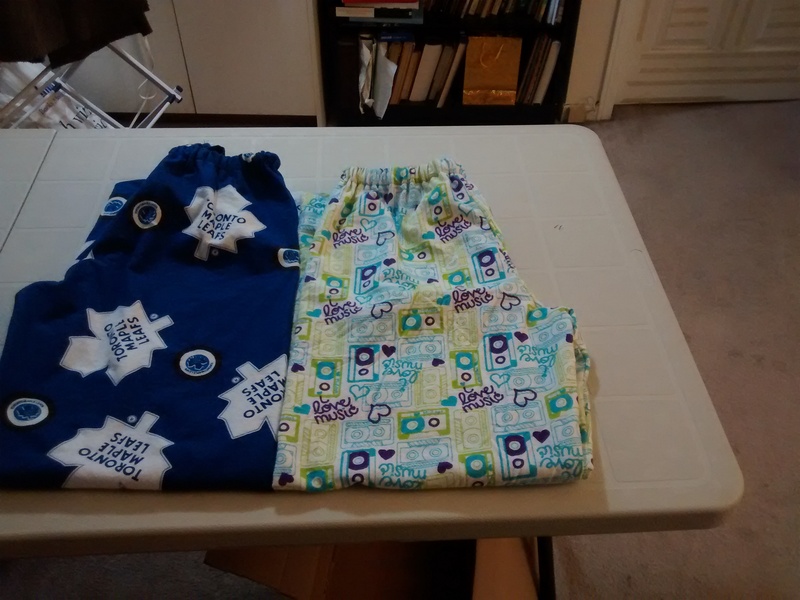 The Toronto Maple Leafs flannel was picked up locally and was ridiculously over-priced, imho. Licensed fabric here is ridiculous! And every time I look at flannel the prices scare me. Why is it so expensive? It’s for pj pants and quilts! Rant done. 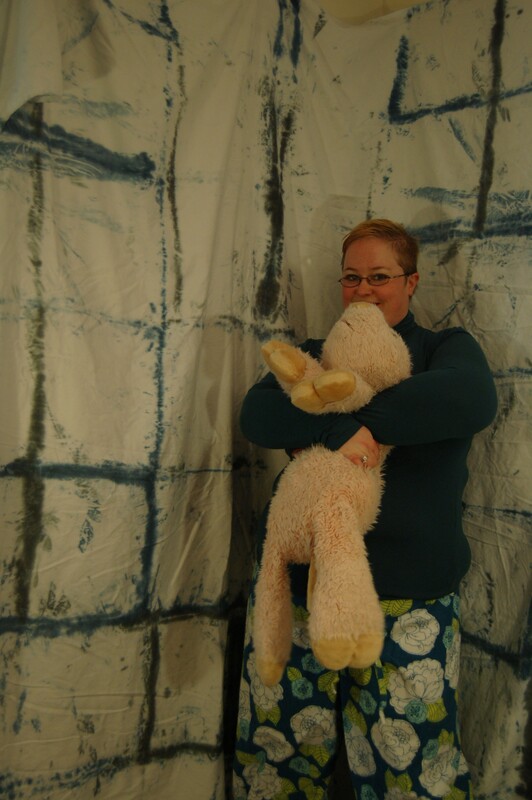 The blue fleece was acquired at the thrift store for $5 and I am glad that I go pj pants out of all that sewing. I also have two more prints cut out for myself and ready to go. I love lounging around the house in pj pants. Comfy, womfy. All of the flannel pants got french seams. The fleece ones were just zigzag stiched and left with raw edges. Horrible low quality image. Sorry about that. 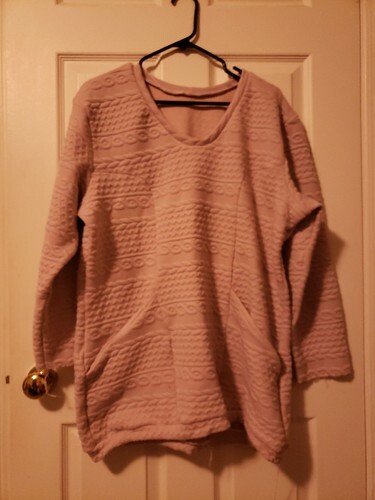 But I knit this with Lion Brand Wool-Ease using their free pattern for a raglan sleeve sweater. 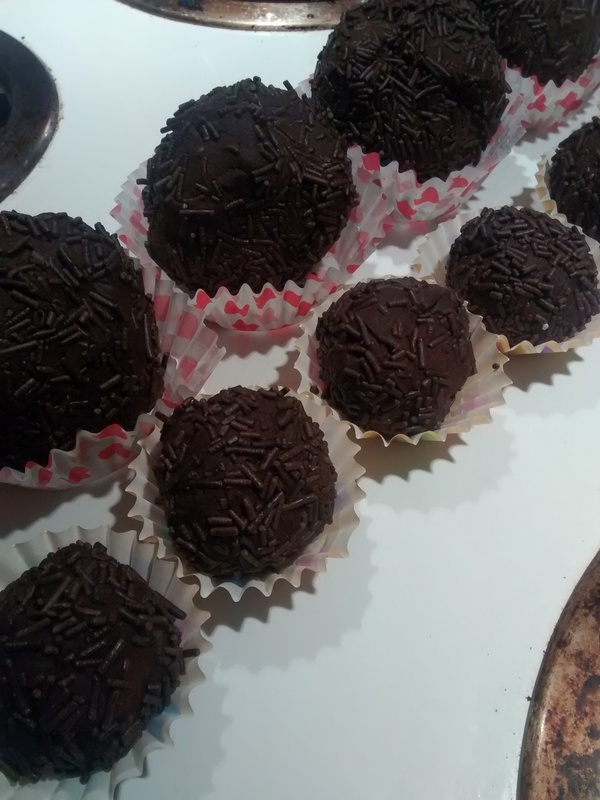 I made my usual rum balls this year, but refrained from all the usual Christmas baking I do. I think I might still make mincemeat tarts because my mom left me all sorts of jars of her delicious mincemeat and I should probably do the task of eating that. It’s such a difficult life…. (mmmm, mincemeat tarts). 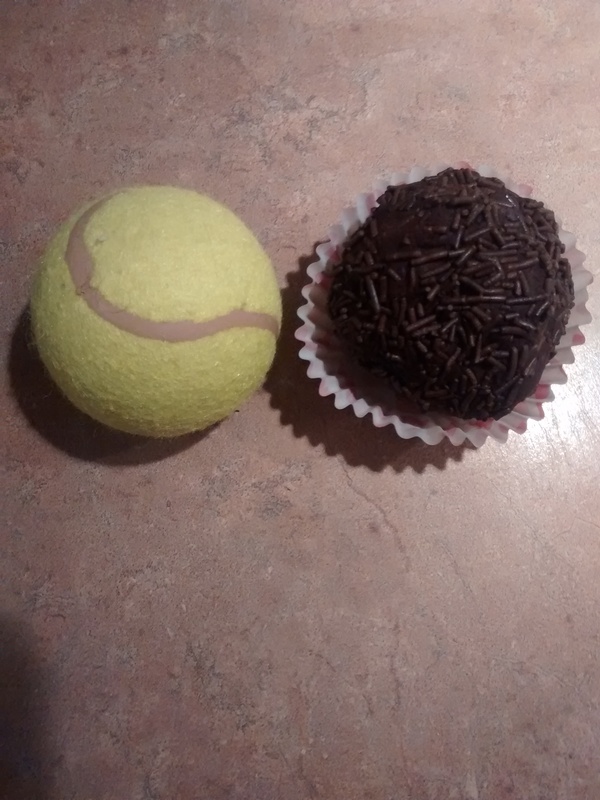 If you didn’t notice, I make huge rum balls at the request of my fiance and they are rummmmmmm laden. Not for kids. I hope that you had a lovely Holiday and a wonderful New Year. I have lots more to share with you in the next few days, including my new handmade coat and more!